Another day, another Donald Trump interview: only this time the country's favorite Republican presidential hopeful was in the fitting company of an all-American bald eagle. 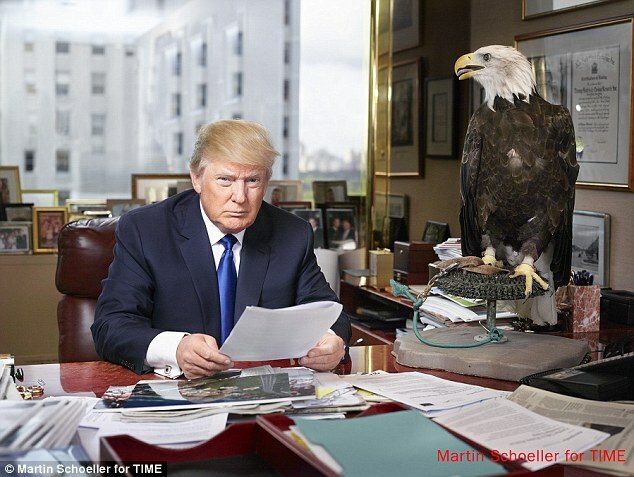 The Donald posed for a TIME photo shoot in his Manhattan office overlooking Central Park on Tuesday alongside a captive bird of prey named Uncle Sam. And while the wild raptor proved difficult to keep in line, photographer Martin Schoeller admits Trump and his signature 'blue steel' gaze remained unchanged in every single frame. They look alike - even the hair. Obama’s desk is just like him. Are those Hillary’s emails on Trump’s desk? If a cluttered desk indicates a cluttered mind, what does an empty desk indicate? Setting up his next foursome. The busiest part of his day. Ever see a photo of Einstein’s desk? You can barely see Einstein for the piled clutter on his desk. Nice PR move. Hope to see Uncle Sam at a variety of Trump's appearances. Maybe train him to take out drones. He looks like he is getting the job done - no fooling around. The article states that his perpetual scowl is his preferred, perfected camera look, going back decades. That’s a good thing. We should all be angry. Wonder if he’ll hold up to make Times man of the year. Another sign I had in my office 30+ years ago. “ A clean desk is the sign of a sick mind”. Correct. Busy desk, busy mind. Empty desk, empty mind.